Is "Whip My Hair" singer Willow Smith actually the leader of a huge underground criminal empire? Maybe! Willow Smith is famous for two reasons. First, she's the daughter of Will Smith (and real creative on the name there, Will). Second, she was the singer of last year's hit single "Whip My Hair," a song that is way more catchy than it has any right to be. Street Fighter's M. Bison, on the other hand, is an evil dictator who runs the nefarious Shadoloo criminal empire. Unlike Willow Smith, he does not have a Billboard hit single, but instead relies on his terrifying Psycho Power to grind his enemies into dust and cow them into submission. 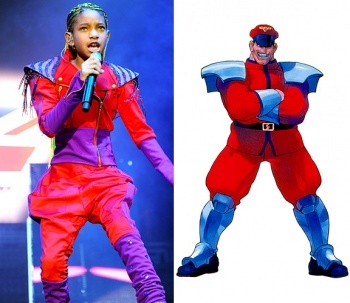 So on one hand, you have Willow Smith; on the other hand you have M. Bison - and ne'er the twain shall meet, right? Perhaps not: Willow Smith performed in Manchester, England last night wearing an outfit that MTV Style noticed bore more than a passing resemblance to Bison's iconic duds. Seriously, that's just uncanny - I might be able to forgive it if it were just the red-and-purple, but the wrist bracers? The puffy thigh-pants? The silver freakin' shoulderpads? Now, I'm not saying that the 10-year-old Smith is actually an evil mastermind who rules the world from the shadows while tangling with the likes of US Special Forces and Interpol, but I'm not saying that she isn't, either. Maybe someone should get Zangief Kid on the phone.